Canada Note: If you are in Canada, we would encourage you to purchase it from here: www.apostoliccenters.ca and save money on the shipping. how to collectively impact the world through the power grid of apostolic networks. If you desire greater kingdom impact in your region, and if you want to unleash God’s purposes for His church, Apostolic Centers is the guide to transforming your local church into a vibrant body—one in which every believer is an active catalyst for the kingdom. 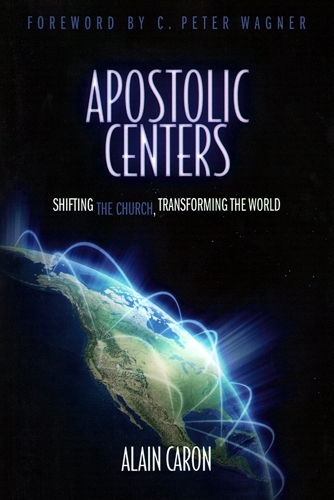 Alain Caron has written a wonderful book called Apostolic Centers: Shifting the Church, Transforming the World. Not only does he communicate his own journey into apostolic rule, but also he discusses the apostolic mandate that was given to Jesus, our apostle. This apostolic mandate is supported by teams and networks and has a great sending power to cover the earth with the glory that is being sent from the apostolic center. One incredible chapter in this book is “How to Switch Wineskins without Spilling!”—in which Alain assesses how to shift wineskins from church to apostolic center without becoming torn in the process and spilling the new revelation for the future. I have been privileged to visit Le Chemin in Gatineau, Quebec, across the river from Ottawa, Canada. What is written in this book is a reality. 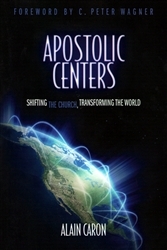 Apostolic Centers is a must-read for those in the process of making the shift from church to apostolic center in their ministry. I recommend this book for any leader who desires to hear what the Spirit of God is saying to the church at this time. Chuck D. Pierce, President, Global Spheres Inc. Glory of Zion Intl. The church is in a major shift, and a kingdom mindset with progressive vision is greatly needed. Alain Caron fills in the gaps for us in this season of changing garments with practical insights from his life’s experience. Caron does an insightful job of developing new wineskin strategies for the day we live in. Alain Caron has written a book that builds bridges. As an apostolic leader of a local assembly of believers, he is uniquely positioned to write this practical blueprint that both inspires and instructs others on the process of transitioning local churches into apostolic centers. Alain Caron serves as the apostolic team leader of Église Le Chemin, a dynamic expression of Christ’s body located in Québec. He is also the founder and director of Hodos, an apostolic and prophetic network that connects and aligns like-minded ministries and believers toward the advancement of the kingdom of God. Alain and his wife, Marie, reside in Gatineau, Québec, Canada.